February 13, 2012 - Happy Monday! I've decided to make a pot of soup today. I'm not sure what's gotten into me lately... but soup just tastes so good and I normally can take it or leave it. Every since I made that onion soup at Christmas... I've been on the soup binge!. Today... I found this recipe on Pinterest (of course....) and it just looks so yummy!! Yum...Yum... give me some!! 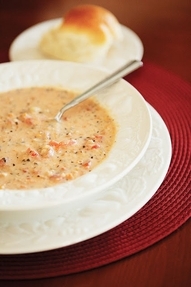 Creamy Tomato and Basil Soup! So... what do you think? Doesn't it sound yummy? The reviews were fabulous...!! Hey... you gotta see this!!!! HAHAHAHAHAHAHAHAHA!!! Isn't he cute! 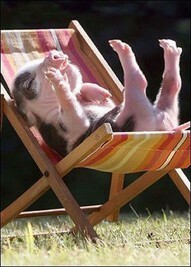 Just a 'bakin' in the sun!! Have you ever been to a pig farm? wwwhhhhhoooiiiieeeeeeee.... is it stinky!! Can't get it out of your clothes either!!! DON'T GO!!! TRUST ME!!! 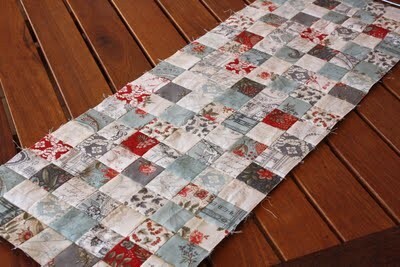 She has step by step instructions on how to make these squares pieced together - quickly! Why...can't I think of these things? You know how we all seem to like to collect things? Well... here is a strange thing to collect... I think anyway!!! with the candles still in side them! Why is this so strange? Well... most of the time the candles would have been used... nothing but empty boxes! now... I must tell you... I've done a ton of antique shopping in my 62 years of life... and I don't EVER remember seeing a collection like this. Actually.... 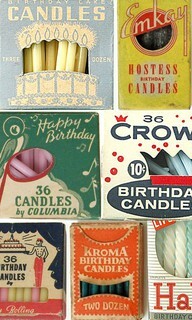 I don't ever remember seeing candle boxes at all. Of course... it's not something I would necessarily be looking for. Now I suppose I'll see many of them while antiquing... YOU may see some too! Hey... that way we'll all keep thinking of each other as we're looking for our favorite antiques! I just want you all to know... I'M FREEZING!! I don't know what the temperature is outside at the moment... but it's 64 in the house and I REFUSE TO TURN THE HEAT ON!! I don't know about you... but for some reason when the heat is on... my electric bill is MORE than when we run the air conditioning. Does that happen to you too? I know.. if I would get up and get busy... straightening, vacuuming, dusting, doing dishes, laundry... I would warm up real fast. NNNNAAAAAHHHHHHHHHH.... not yet... it's just too early for that! The coffee still hasn't warmed me up yet.... what is a girl to do??? Hey... check out this pillow... it's made from place mats!! 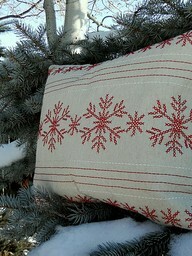 I think it would be adorable for Christmas pillows...don't you? 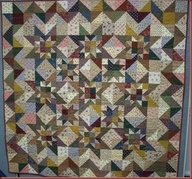 Here's one of my favorite scrappy quilts - from Bonnie Blue Quilts !!! I think it's still one of their top sellers!! If you would like to order this pattern from them... here is their website! They have such fabulous patterns. They both will be joining us again at our September, Camp Blanding Retreat. Paula will be teaching this time!!! YIPPEE!!! PLUS... Faye Heyn will be teaching also!! Two wonderful instructors... love them both to death. Ok... I give in... it's time to get up and moving so I can warm up. Clean off your kitchen counter! Do you have a counter that has everything on it? You DO KNOW that makes for a cluttered, small kitchen... right? Only put those items on the counter that you use on a DAILY basis... everything else can be stored away. You'll be surprised how much orderly your kitchen will look. Try it for 2 weeks and see what you think.... then let me know!